Yet again, Britain has suffered from the natural elements with widespread flooding throughout November, particularly affecting parts of the west of the United Kingdom, the West Country and parts of Wales. Frequent occasions of heavy rainfall when water tables are already full continues to be the trigger point, but why are these occasions becoming more frequent, creating more damage and compromising so many villages, towns and cities? Floods recently devestated the West of England, but how much of this is avoidable? This has traditionally been blamed on farmers increasing the drainage of their lands into the streams and rivers of the UK. 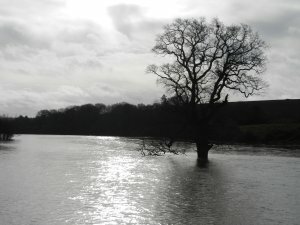 Unsustainable and unholistic drainage techniques have been a problem, but increasingly it is clear that the inexorable development of floodplains and river basins in recent years is now the greater issue. Development means concrete, slate, cement, steel, asphalt, Upvc and other impermeable materials. A green field soaks up and holds water, delaying its passage through the water basin and down to the local river and transferring that water via the slow process of ground water flow. Now hard, non-porous surfaces turn precipitation in surface-run off, the fastest form of flow (second only to river channel flow), which transfers the water rapidly to the river or tributary, speeding up the rate at which it reaches bank full discharge and overflows. In short, the water flows much faster to the river, creating dangerous flash floods that cut warning times and increase river flow. Developing on a flood plain obviously puts property at risk. Floodplains are naturally designed to allow rivers to overflow in times of high precipitation and building on them merely decreases the surface area of this water to drain, increasing the range of the flood affected area and thus effectively creating bigger, wider reaching floods. Any property on that floodplain may be water affected, and the 2007 floods showed that the average cost of this damage (in that case for over 48,000 homes) will be between £20,000-30,000 in repairs. Clearing the site for development frequently means removing trees and some sites are even at the expense of removed woodland. Trees naturally slow the flow of precipitation into rivers, by intercepting rain on their leaves and drawing water from the ground to release back into the atmosphere (evapotranspiration). Removing these trees obviously removes this beneficial, natural flood defence; a problem that has not been helped in recent years by the potency of diseases affecting larch, Dutch Elm and now Ash trees. What with climate change reputedly having a progressively bigger impact, it appears we may have to get used to this. Unfortunately, the first three of these, and arguably even the fourth to a lesser extent, are problems that will be compounded by the Government’s drive to continually encourage development, seemingly at all costs, in the hope to ‘build our way out of recession’. (See our article on Nick Boles MP’s revelation that he wants 1,500 square miles of green land for development). The problem with this is that whilst encouraging development momentarily increases economic activity and benefits the economy through a wider multiplier effect, it does not induce sustained growth. Whereas this may create a temporary stimulus, greater floodplain development will undoubtedly come either at the expense of long lasting issues with flooding, which in 2007 alone cost the economy £3.2bn, or a vastly expensive programme of flood defences. Still, never mind – extra money that we haven’t got, on flood defences that we shouldn’t need, can only makes things better. Right? What might the solution be? 1. Don’t build on the flood plain. Allow the river to naturally overflow as nature intended and avoid unnecessary damage and disruption. Of course, this creates planning issues, obstructing those that wish to develop on these plains. The solution is a stronger planning department that will condone sensible construction on the outskirts of towns, where restrictive planning boundaries sometimes stop all development without question, but resist the persuasiveness of developers in unsuitable areas. 2. Plant woods on unused land. Land within a river basin that is unused and has no immediate prospect of use, should be bought up by the Government and planted. 3. Clean and maintain the rivers. Heavy silting of rivers is obstructive to the water flow and reduces the peak volume that can be carried. Dredging rivers most liable to flooding will assist with this. The work could be contracted out to the private sector, helping to create the sort of growth stimulus the Government wants and reduce unemployment for low skilled workers at the same time. The great push towards development seems to be borne from political desperation; a keenness to be seen to be doing something with the ailing economy and a natural outlet in the housing industry where they have some control (and in which they are frequently, dare I say, shareholders themselves or at the very least under a large amount of pressure from lobbyists). I would suggest that a more pragmatic and holistic view of development and flooding needs to be taken; one which won’t give tens of thousands of homeowners wet feet and a £20,000 headache in a few years time.